When you log on to TouchPoint, the first place you will be is the Home Page. The exception are My Data users. They can view only their own people records, and do not see the Home Page. Lay Leaders with OrgLeadersOnly do have access to the Home Page. The Home Page contains quick links to both people, organizations, reports, and more. 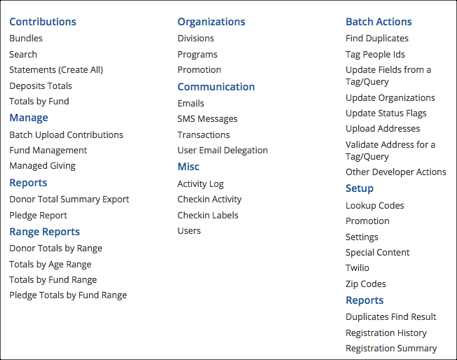 The Home Page is divided into several section or boxes. All but the TouchPoint News and Church News sections will contain links which are specific to the user that is logged on. This section displays a list of people who have upcoming birthdays. The default uses people who are in your Main Fellowship class. However, you can create your own TrackBirthdays Tag or a TrackBirthdays Search. The Involvement section will contain links to every organization in which you are currently enrolled. These links are to the Search Builder searches that you have created and saved, or searches that the Admin has saved with you as the owner. It is a very quick way to access searches that you use frequently. 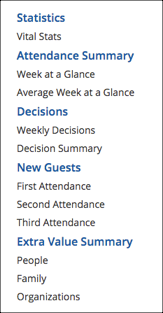 This section contains the same content for every user at every TouchPoint church. You should subscribe to the TouchPoint News blog, so you receive an email when something new is posted. This is where we notify you about all new features, remind you of existing ones, give users tips, and more. Posts will have a New flag for a couple of weeks after they are posted. This section is controlled by each church for their church’s TouchPoint database. Every user at that church see the same content. These are links to all Tags that you created and any Tags that have been shared with you. The shared Tags, will have the owner’s name in front of the Tag name and those will be below yours in the list. Any incomplete Tasks that you have been assigned or you have created and have not not assigned to anyone else will display in this section. Some will be ministry Tasks, while others may be New People Data Entry Tasks, if you create new records. Across the top of the Home Page (and most other pages) are headers for the main menu. These are drop downs menus with other options. See note below regarding adding people. Five most recent people records you have viewed. Quick link to your own people record. Some churches have the Add Person feature turned off from the Main Menu and require that new records must be added in context. Vital Stats - a report that will be in every database. However, it can be edited as it is based mostly on saved searches. It contains attendance and contribution data, as well as membership information, and more. Each of these are links to reports that also contain links to Search Builder to find the individuals or organizations containing those Extra Values. If your System Admin has created special SQL reports and chosen to add them to the Menu, this is where they will display. Note: some reports are designed to display on the toolbar instead of in this section. Where the report will display (either here or the blue Toolbar), if you choose to put it on the menu, is set in the SQL code itself. This header contains items that are needed by the System Administrator, those with Finance, Manage Emails, Manage Transactions, and Content Edit roles. Users with Edit can Access Promotion under Organizations. 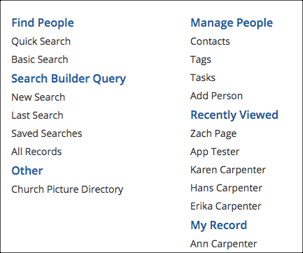 On the right side of the Main Menu is Search, which works like Google search to help you find people or organizations. This also contains links to various options in Search Builder and will display your most recent saved searches. Next to Search is your Active Tag, with the option to empty the active tag, or to select another Tag to become your active one. Just scroll down to see all your Tags. Your profile picture will display in the far right of the Main Menu bar along with your name. Click the drop down to go to your people record, change your password, log out, or to change any of the toggles that are presented there. There is also a link directly to the Documentation Website, where you will find the Contents, Index, Recently Updated list, as well as a search feature.